Replacing the connections will need to take place before 31 may 2018. Last week I was performing these actions for a client and noticed that I had a BizTalk service (new portal) in one of our production resource groups. To clean up nicely I replaced the hybrid connections and wanted to drop the BizTalk service, in the new portal this wasn’t possible (It only redirects you to the old portal) and clicking on it navigated me to the old portal (https://manage.windowsazure.com). For some reason the portal wasn’t able to load correctly so I still wasn’t able to drop the service. Since deleting the resource group isn’t a option (we had other azure services within the group) I though of another solution that I wanted to share with you. Navigate to : https://resources.azure.com and login with the Azure Administrator and make sure you choose the right subscription. https://resources.azure.com will open the Azure Resource Explorer which is a website/tool that you use to explore the Azure Resource Manager APIs and do API calls on your Azure subscription. With the Azure Resource Explorer open navigate to the subscription and find your Resource group in which the Azure BizTalk service resides. 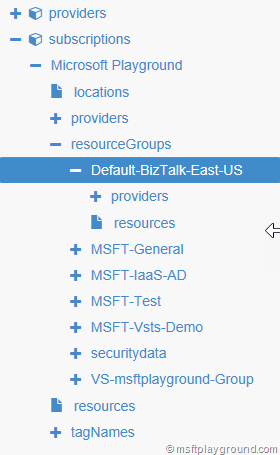 Click open the providers and look for the provider “Microsoft.BizTalkServices”. This provider has al the BizTalk Services in the resource group. Click on the BizTalk service that need to be removed and click on it. 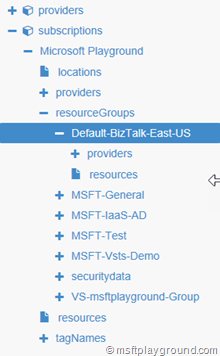 Information of the Azure BizTalk Service is loaded and in the top bar you are able to open a “Actions” tab. Opening the tab will give you the option to delete the classic BizTalk Service from your Azure Subscription. Click on “Delete” to do the delete API call. Processing the call will take a couple of seconds and after that the Azure BizTalk Service is removed.